UPDATE: Public Safety Minsiter Vic Toews' took to Twitter on Thursday to suggest Justin Trudeau and the Liberals were behind the Vikileaks account that released information about his divorce. Vikileaks creator Adam Carroll is back at work for the Liberal Party, HuffPost Canada has learned. Carroll was asked to resign this February from his job on the hill after interim leader Bob Rae learned he was behind a Twitter account that posted details of Public Safety Minister Vic Toews' divorce. Carroll was hired earlier this summer and has been working in party fundraising. Asked why Carroll was hired to work at Liberal Party headquarters, Liberal Party spokesperson Sarah Bain said "we simply do not comment on personnel." At the time of Carroll's resignation, Rae "unreservedly" apologized to Toews in the House of Commons and said he would be making it clear that "political controversy is one thing, personal attacks are another." Liberal MP Justin Trudeau, who had initially shared several Vikileaks posts on Twitter, wrote that he was "Appalled to find out Vikileaks came from us Liberals. Yes, I tweeted about it, but I did not endorse it. Personal attacks are always wrong." 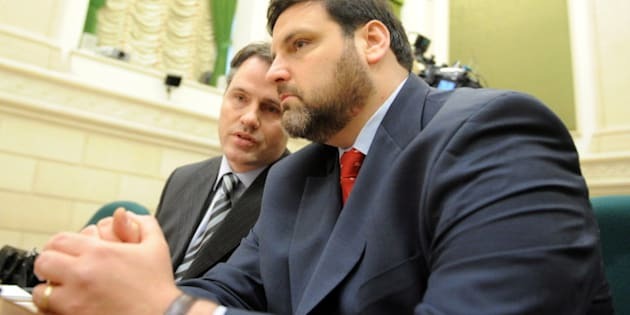 Carroll told a House Ethics committee in April that Toews' argument that those opposed to the government's online snooping legislation, Bill C-30, were standing with the child pornographers led him to start the Twitter account. Carroll called Toews' language polarizing and he said he felt compelled to bring attention to the threat posed by the bill. "I took an approach that, put simply, argued, if the minister feels strongly that he should know everything about us, perhaps we should know more about the man who wants unrestricted access to our information," he said. "To make the point further, everything I posted was from publicly available documents." After Carroll's testimony, Rae explained why Carroll's actions had led to his ouster. The interim Liberal leader said all parties have that kind of information on each other. The question is whether it is appropriate to use it, even if it is in the public domain. "That's why Mr. Carroll is no longer with us," he said. One Liberal official insisted that Carroll's new job should not be seen as a Liberal Party re-hiring. "This is a different employer and a different role than he has played before," the Liberal said.